All of our craft beer on tap goes through this process to ensure that you’re drinking only the freshest beer at Granite City in Northville. If for any reason you have any questions or comments about our beer on tap in Northville, feel free to give us a call at 248-662-3400 or fill out the form on this page and a representative will respond shortly. We offer flights of our signature and seasonal beers so that you can see which beer you enjoy the most. All of our beers on tap in Northville are brewed on site and we also have seasonal brews that are featured throughout the year. What makes our beer on tap in Northville taste so great is we take the wort shipped in from our central brewing facilities and ferment them on-site at every Granite City location. In fact, all of our craft beer on tap goes through this process to ensure that you’re drinking only the freshest beer at Granite City in Northville. 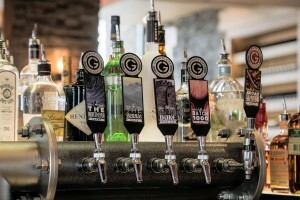 Our beer on tap in Northville can only be found here at Granite City Food & Brewery. Stop by Granite City in Northville today and see what great craft beer we have on tap. Our beer on tap in Northville is very reasonably priced compared to other craft beers and can be complimented with our delicious food. If for any reason you have any questions or comments about our beer on tap in Northville, feel free to fill out the form on this page and an associate will respond shortly or give us a call at 248-662-3400.